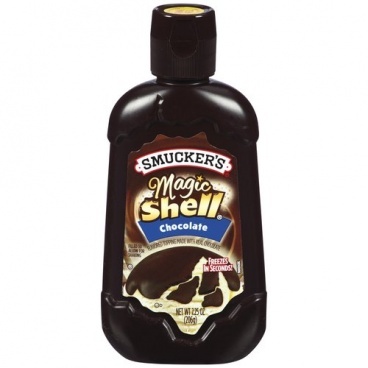 Smucker's Magic Shell Chocolate 206g Smuckers Topping. Freezes in seconds to give it that Magic shell. 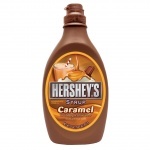 Works best when shaken very well.Before each use, turn bottle upside down And shake well for at least 20 seconds. 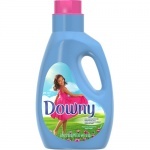 If topping becomes thick and does not flow easily, or if oil separation occurs, run the bottle under hot tap water for up to 2 minutes, shaking occasionally. Do not refrigerate. If refrigerated or stored in a cool place, magic shell topping will harden. Run under hot water until topping turns liquid.Store at room temperature. Sugar, Sunflower Oil, Coconut Oil, Cocoa, Chocolate Contains 2% Or Less Of: Cocoa Processed With Alkali, Soy Lecithin, Salt, Vanilla, Milk.